It sounds weird, I know. And the pictures aren't very pretty (brown food in particular is not very photogenic). But this chocolate pudding is really fantastic. It doesn't heat up your house making custard like regular pudding, it includes protein and is dairy-free. Depending on the type of tofu you use, the pudding will have different textures. A silken soft tofu will give you a pudding texture similar to those chocolate pudding cups at the grocery store. A firm tofu will give you a stiffer mousse-like quality. I got the recipe from a book called "What Einstein Told His Cook: Kitchen Science Explained" It's a silly book but I learned a few new things and got this fantastic recipe. Everyone should try it out. I guarantee it tastes just like chocolate pudding. *Note: you can use either espresso or kahlua in this recipe. If you use espresso, you can use semi-sweet chocolate chips. If you use kahlua, it's much better when you use dark chocolate. Make sure you use a vegan chocolate chip like Trader Joe's brand (if you care about that kind of thing). 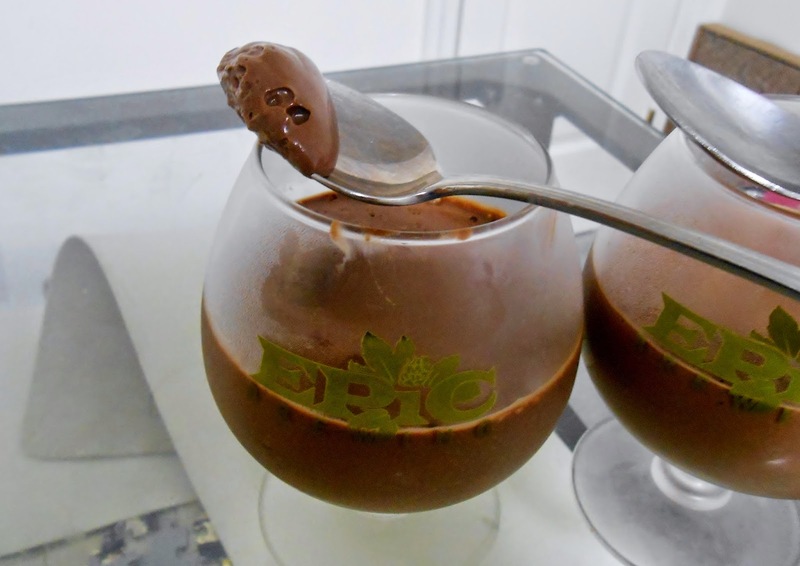 While blender is running, pour melted chocolate into the blender and blend until smooth and uniform.